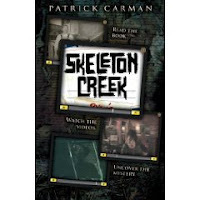 A few weeks ago I reviewed Skeleton Creek by Patrick Carman and it is available today! So head on out to your favorite bookstore and look for this creepy book. And if you like all things creepy, you won't want to miss the Skeleton Creek live webcast from 6:30 to 8:00pm (Pacific time) on Friday the 13th. Make sure you bookmark that site and head over there on Friday to chat and ask your questions! I have a review of this one going up this morning. I was SO impressed... such a brilliant idea!